theZoomer: Television For Boomers With Zip! Zipping Around the Pool with a 68-Year-Old Ultimate Zoomer - theZoomer: Television For Boomers With Zip! There is a broad misconception out there that as you get older, your ability to perform impressive athletic feats dissipates. One woman who totally understands this is 68-year-old Liliane Cardinal. “I started swimming at least 30 years ago,” revealed Cardinal during an interview with Darrin Maharaj of ZNews. 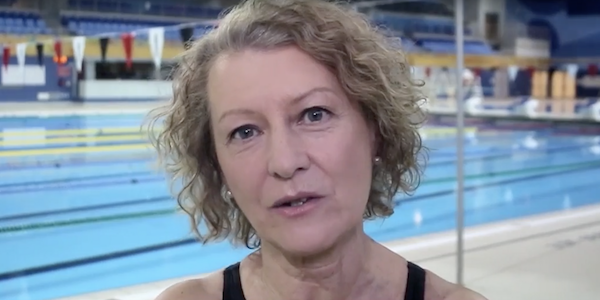 What got Liliane into the pool was her daughter, Tracey, who as a youth was coached by someone that also trained adult swimmers through the Masters Swimming Canada program. Thanks to her incredible swimming prowess, exceptional vitality, and admirable spirit, our colleagues at Zoomer Magazine have recognized Liliane as an Ultimate Zoomer. Liliane will soon be featured in a full-page profile within a forthcoming issue of the magazine. Until then, we encourage you to check out Liliane in action! On a recent episode of “theZoomer,” host Libby Znaimer was joined by Zoomer-aged athletes, including Body Break’s Hal Johnson and Joanne McLeod, to discuss tennis, swimming, golf and cycling. You can watch this episode below.